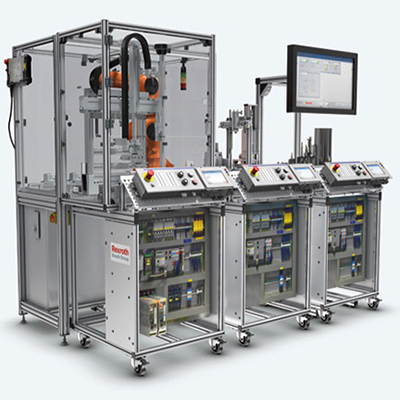 The Industry 4.0 Mechatronics (mMS 4.0) training system is a complete Industry 4.0 system in miniature for universities and educational institutions, supporting the next generation of engineers. For mechatronics training or further education, the training system, conveys pioneering Industry 4.0 technologies in an intuitive and practical manner. mMS 4.0 incorporates all of the functions of a complete production system. Consisting of three single stations, its modular design allows for complete flexibility adapting to individual needs appropriate for every learning path, both in academic and industry environments. The system addresses a real-life cube assembly, from the removal out of a rack to processing with a pressing machine and through to storage in the high-bay warehouse. 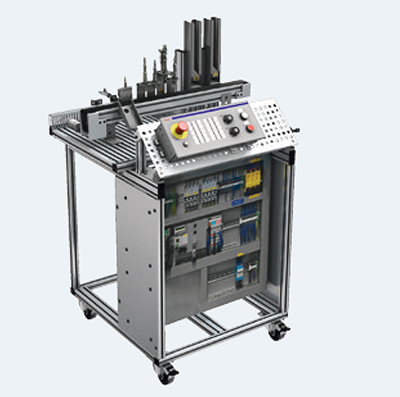 Assembled from standard components, mMS 4.0 is completely interconnected and programmable via bus systems and extensively secured. Cells can be flexibly added to the system, such as with a 6 axis robot. The system can also be integrated with Bosch Collaborative Robotics and be connected with the PPM (Production Performance Manager) software. The entire system or individual stations are shipped fully assembled, installed, and programmed. You can get started right away. The Bosch Rexroth Drive & Control Academy supports instructors and universities by providing training courses, training systems and modern media on the topic of Industry 4.0. The academy supports customized education and training, as well as the certification of technical experts. Participants could choose to be trained in Germany, England, Mexico, India – and many other Bosch Authorized Training Centers around the world. Operation with smart devices via Wi-Fi possible, e.g. tablet, smartphone, etc. One controller to handle the functions of a PLC and CNC. 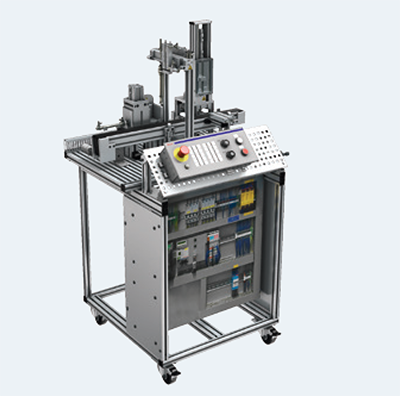 The modular Mechatronics System (mMS) – without Industry 4.0 technology Ì is also available for teaching Automation Technology as an affordable alternative to i4.0. The mMS comprises of all drive, control and movement technologies such as pneumatics, hydraulics, electric drives, linear technology, sensor technology, control technology, PLC programming or BUS technology. It is noteworthy to mention that the mMS system is upgradable to i4.0. "AYVA has provided us with excellent support in getting training equipment that will enhance our chemical engineering labs. We have had the opportunity to work with their knowledgeable staff as well as representatives from TecQuipment and PIGNAT. We especially appreciated Sean McLaughlin, Technical Services Manager’s time and expertise when we purchased the H83 from TecQuipment. He was extremely responsive and resourceful during the on-site installation." "I have worked with the AYVA team to upgrade my Mechanical Engineering lab. We have not only been provided with excellent pre-sale service but we also received valuable support after we placed our order. We were provided access to a number of resources which we were able to use to develop our own customized labs for the students. The structures equipment from TecQuipment is being used to teach student groups in several courses at the undergraduate level. There is minimal setup required and students are easily able to switch between experiments. 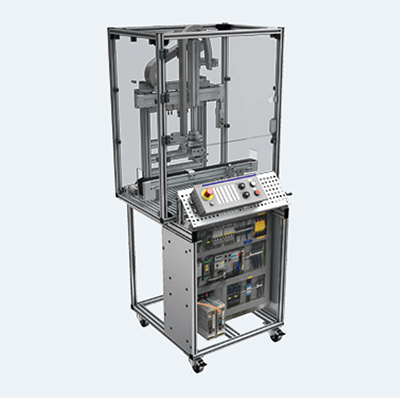 The excellent quality of the TQ manuals has enabled us to design our labs with relative ease. The equipment was delivered on schedule and the AYVA team has been very diligent in following up and providing us with the resources we need in a timely fashion." "Bosch Rexroth’s hydraulics bench is really great! Robust, easy to use, and it offers the possibility to expand and add components to keep up with new technologies. My students are always motivated while working with the bench and I now understand why it has such a strong reputation. It is impossible to regret this purchase!" "We appreciate Pignat's willingness to partner with the university to customize a pilot training system that fits both our needs - and our budget. I want to thank AYVA for arranging a visit to Pignat's factory in France so I could meet the design engineers and see first-hand the attention to detail at every step of the manufacturing process. I especially want to thank my hosts at Pignat for their hospitality during my stay in Lyon. I really had a good time testing our CO2 absorption/stripping unit and seeing all the nice equipment in the plant." "I have used AYVA wireless dataloggers in my biomedical labs and found that the reliable signal processing capability was well suited to my research requirements. I appreciated the prompt delivery and the excellent service that I received from your team before and after the sale. I am hoping to purchase additional units." "I’m very pleased with the fast and professional service that I’ve received from AYVA Educational Solutions. I am able to contact an AYVA representative any day of the week and receive a prompt response. AYVA’s representatives are happy and willing to accommodate any changes, modifications and suggestions. I highly recommend using AYVA Educational Services to meet your educational needs." "In recent years, there has been a growing demand for engineering equipment in the undergraduate labs at the University of Guelph as we have expanded our program. AYVA has been proactive and assisted us diligently in addressing all our equipment needs. We now proudly showcase both PASCO and TecQuipment products in our teaching labs. The quality of the equipment and teaching material is exceptional. AYVA offers a broad range of equipment well suited to our various engineering disciplines and we look forward to exploring their extended product offering in the future." "I have worked with the AYVA team since they launched in 2008 to equip our Science and Engineering labs. They have consistently gone above and beyond to ensure that we were prepared to meet our curricular goals and deadlines. I have been impressed by the breadth and quality of the lines they represent. We have purchased both PASCO and TQ equipment to enhance our teaching labs." "TecQuipment's structures line was chosen to enhance the learning experience of our engineering students. The products were delivered in a timely manner and were easy to set up. After-sales support has been very accommodating, allowing us to modify the experiment manuals as we saw fit, giving us flexibility in learning objectives. Students have shown great interest, and have found operating the units to be easy and simple." "Out of all the data acquisition systems I'm aware of, nothing approaches the convenience of the PASCO 850 interface. Between the broad range of available sensors and the simplicity of starting data acquisition, a wide range of tasks that would be incredibly complicated otherwise can be automated in minutes ... We have dedicated computers and 850 interfaces at each station in our labs so that data acquisition can be accomplished easily by our students whenever needed." "I am a long-time user of TecQuipment products - in particular the Modular Structures Range as well as other Materials Testing equipment. I find the modules (over 10) very easy to set up and, more importantly, my students find them extremely easy to use as they move from station to station conducting a wide variety of measurements related to structures and materials. Each experiment can be completed in 30 to 45 minutes and I can accommodate several students working in groups of three. It is a great addition to both my Basic Structures and Hyperstatic Structures courses."